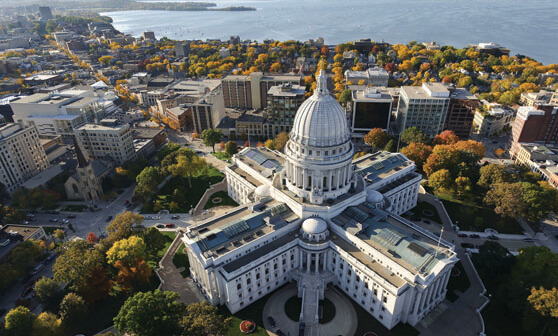 Madison and its surrounding communities offer the perfect combination of small town charm and urban sophistication to visitors and residents alike. Add to that the area’s spectacular natural beauty and you will quickly discover why Madison is known as one of the nation’s best places to live, work and play! Built on an isthmus between two glacial lakes, Madison is a city literally surrounded by natural beauty. These lakes and more than 200 city parks are open year-round for limitless recreational opportunities. We invite you to experience the beauty of the season with a walk or bike ride along one of the area’s hundreds of miles of paths or by taking a scenic drive to one of Madison’s inviting neighboring communities, each with their own unique personality. Madison offers families plenty of free or low-cost activities, from one of the nation’s few remaining free zoos to lush botanical gardens and a host of museums. Other wonderful attractions include Overture Center for the Arts, Madison’s breathtaking new performing arts center, and Frank Lloyd Wright’s Monona Terrace® Convention & Community Center, a jewel in the city skyline. Don’t forget to explore Madison’s surrounding communities for some great attractions like Little Norway, Cave of the Mounds, Taliesin, the Crane Foundation, Circus World Museum and more! There are many exciting opportunities just a short distance from our capital city. Located along I-90/94, Madison is easily accessible from most Midwestern cities. For those traveling longer distances, we also feature the Dane County Regional Airport with direct connections from 15 major-market U.S. airports. However you get here, it will be easy to see why so many admire our vibrant destination. The Greater Madison Convention & Visitors Bureau is your official guide to all things Madison. From Visitors Guides to Maps and more, we have everything you’ll need to plan your perfect Madison experience.